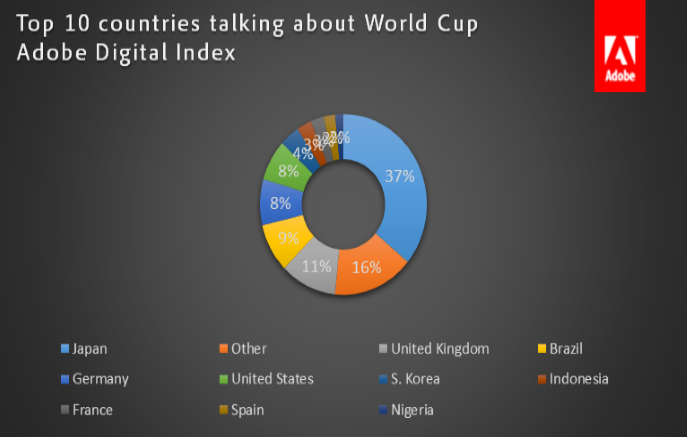 Adobe Digital Index released social media data and insights around pre-World Cup buzz and sentiment across Facebook, Tumblr, Twitter, Disqus, among others. The proprietary global report and graphics looked at 69+ million social mentions in 230 countries and territories around the world to identify conversation trends across regions, teams and players compiled by Joe Martin, Adobe manager and analyst, at ADI. The Sports Techie community blog spoke to Joe about their 2014 FIFA World Cup Big Data numbers and analysis. 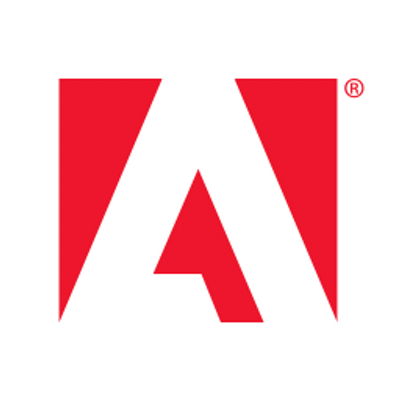 Adobe Digital Index publishes research on digital marketing based on the analysis of anonymous, aggregated data from over 5,000 companies worldwide. Joe lived in both Brazil and England and has seen many a pro football match. He now lives and works in Lehigh, Utah. The concept behind compiling and breaking down the Brazil World Cup social buzz was to be a thought leader in social media, entertainment, consumer press, and with marketing practitioners. ADI has done similar analytics of movies with the Hollywood Reporter. If you are a business owner or executive, ADI is ready to do the same for you on the topic of your choosing. 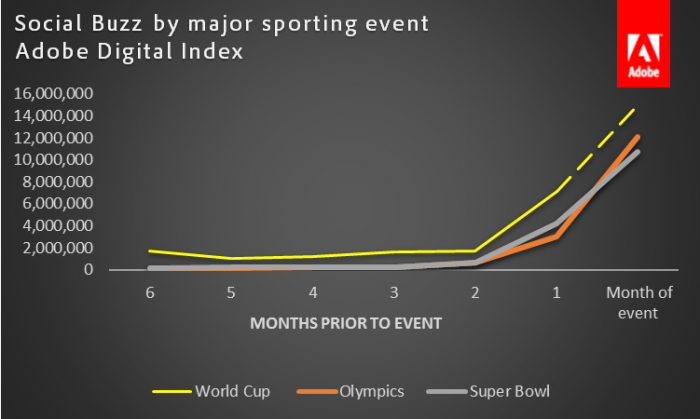 The ADI broad cut of data after one-month verifies Brazil will host the most social event ever, and that includes the Super Bowl and Olympics. Martin looked at 230 of 255 total countries and more than 35 language versions of the World Cup and related terms were tracked since last June. An astonishing 90 percent of global fans mentioned the World Cup while 84 percent discussed the Olympics and 78 percent touched on the Super Bowl. Of course, I would like to think that nearly 100 percent of my fellow Seattle Seahawks super users where all highly social media active during the Hawks run to winning Super Bowl 48. Their social buzz criteria also tracked sponsorship, revenue and web site activity via mentions captured from Facebook, Google+, Reddit, Twitter, Dailymotion, Flickr, Instagram, Tumblr, VK, Disqus, Metacafe, WordPress, and YouTube handles using the “Adobe Social” listening tool. A third party tool created by GNIP, the source for social data, was used for Twitter streams and is integrated into this “Adobe Social” project. Video criteria was another game-changing “Adobe Social” component considering the massive amount of mobile device and tablets users sure to provide boosts to sponsors, advertisers and web sites. The ADI global report looked at 69+ million social mentions in 230 countries and territories around the world to identify conversation trends across regions, teams and players. World Cup is the most social sporting event in history: The World Cup will become the most social sporting event ever, surpassing the Super Bowl and Olympics in total social mentions. “World Cup” generated 19+ million social mentions since June 2013 so far and 90% of the world (196 countries) has already contributed to the conversation, more than the Olympics (84%) and Super Bowl (78%). 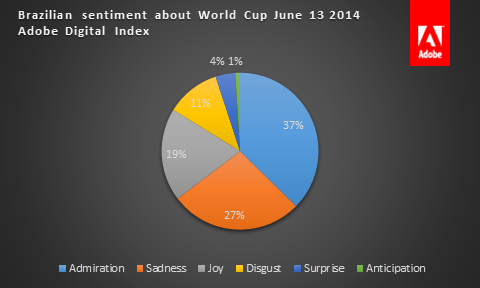 42% of Brazilians have expressed sadness, anger or disgust related to the World Cup. 59% of the social buzz relates to admiration, joy and anticipation. Cristiano Ronaldo is the most mentioned player with 1.5+ million mentions in May, Neymar was second with 1.2+ million. APAC is producing 48% of all social buzz (EMEA: 32%, Americas: 20%): Japan is leading the way with 37% of all World Cup mentions, beating out the U.K. (11%), Brazil (9%), Germany (8%) and U.S (8%). Germany has the highest social buzz as a percent of total Twitter users (17%) in its country. Japan (11%), Nigeria (8%), France (5%) and U.K. (5%) round out the top 5. The APAC region was the clear world leader over the last year, followed by EMEA and then Americas. Japan surprisingly has the second highest twitter penetration, second only to Americas. Martin searched terms like “Samurai Blue” as the Japanese national team is affectingly known. Manchester United midfielder Shinji Kagawa and Keisuke Honda on A.C. Milan have crossed over to the top tier of Professional football to the delight of their passionate fans. The fact that four teams from the APAC are in the 2014 WC is another reasons why their nation’s social buzz is so high. Martin felt that the Premiership core of Team England players plus the pressure of not winning the World Cup since 1966 has the “The Three Lions” nation abuzz in the EMAA online engagements, producing 36 percent of their regions total social buzz. The ADI methodology further highlighted that Cristiano Ronaldo on Team Portugal is the most followed athlete on the planet; he was mentioned more than any other World Cup player, totaling an amazing 1.5 mentions from his 22 million and growing Twitter friends. U.S. soccer left Landon Donovan off their team roster yet he was still in the top ten of all global players. Martin has a feeling that a social shift will happen once the month of World Cup matches are well under way, especially since U.S. fans are locked into the NBA Finals and NHL Stanley Cup, which just ended tonight. I informed Martin that soccer fans in America now outnumber NASCAR fans. Because ESPN’s flagship station and Univision Deportes are broadcasting games on live television, this shift will continue to accelerate especially with the continued addition of WatchESPN app mobile device users. I asked him about World Cup Facebook fan pages and was surprised to hear that only public data was collected using a scraping tool counting mentions on public pages. I also questioned Martin about hashtags and he responded that they are very involved, as are the country code of each team such as USA and ESP (Spain). Mentions were also searched via geotag. I asked about Russia and China who have cracked down on foreign social platforms. The Russian VK platform was part of ADI’s data set however mentions from China were very limited and mainly sourced off the mainland. The 600 million Chinese social media users where mostly ignored as were top social networking sites QZone and Weibo. I wonder why Nigeria and Spain had the same 2 percent of fans talking about the World Cup knowing that Spain is the defending 2010 South Africa WC Champions. Martin felt the penetration rates were less in Spain than the African nation. Adding to this is the performance of the “Super Eagles” in the Confederation Cup and Olympic Games and you begin to understand why the densely populous nation is a top ten social media football savvy and dedicated fan base. Global emotions are another key social buzz factor collected with a listening tool that considers what tweets talked about. 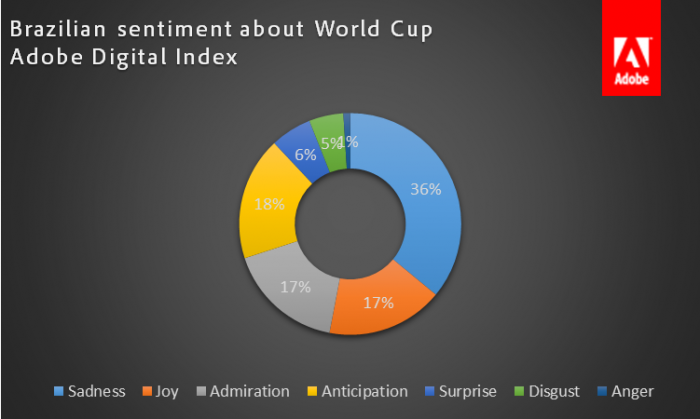 The 59 percent of those queried globally felt positive emotions such as admiration, joy and anticipation of the World Cup. The local emotions and sentiment held by the people of Brazil indicated that protesters in the host nation had made an impact. Martin searched any locals who had “Brazilian” in their bio, or spoke Portuguese or English languages. Their ADI tool crunched trending topics such as stadium completion, in addition to workers exploitation and the funding of public projects. The 42 percent of Brazilians who were saddened, angered or disgusted with their nation’s World Cup state of affairs is no surprise and may rise as the tournament continues, especially if Team Brasil is eliminated early. Sports Techie, Team USA is in the Group of Death, Group G, along with Germany, Portugal and Ghana, which means if we can get out of this stage, “Whatever team survives this bracket will see their social media buzz spike towards unprecedented numbers,” said Martin. Team Brazil’s star prodigy Neymar was an immediate social media draw after they defeated Croatia 3-1 in the opening game played in Arena Corinthians, Sao Paulo. @neymarjr became the most talked about footballer yesterday after his 2 goal first game, he has 2 million+ social media mentions in June. The Adobe Digital Index team will also post stats and insights throughout the World Cup on Twitter, so follow @AdobeIndex for their latest findings. Our gratitude goes out to the team at ADI and Joe for this outstanding look at the 2014 World Cup social media buzz.